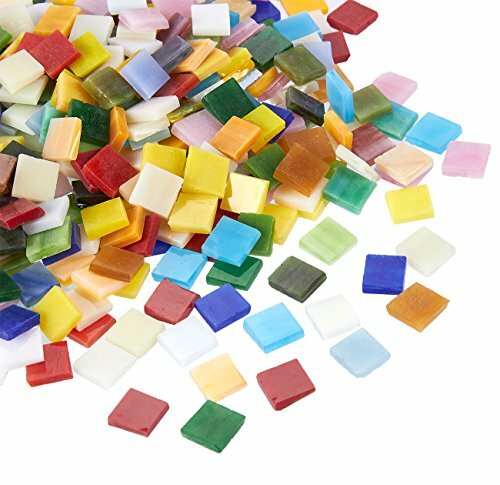 If you want to make a beautiful mosaic then you need this pack of 1000 multicolored tiles. They are made from glass which is a great material for many rooms of the house. They are acid and moisture resistant so your decor will be present in your home for years to come. The bright colors are in a square shape and each tile measures 0.38 x 0.38 inches with a thickness of about 0.1 inches. Make anything you can think of - the only limitation is your imagination. MAKE ANYTHING: Square shaped glass tiles leave what to create up to you. ECO-FRIENDLY: Glass is an eco-friendly material that is better for the earth than plastic. ACID RESISTANT: The tiles are resistant to wear and tear from acids meaning your decorations will last long. USE ANYWHERE: The tiles are moisture resistant so you can use them in the kitchen or bathroom too. DIMENSIONS: Each tile is 0.38 x 0.38 x 0.1 inches.